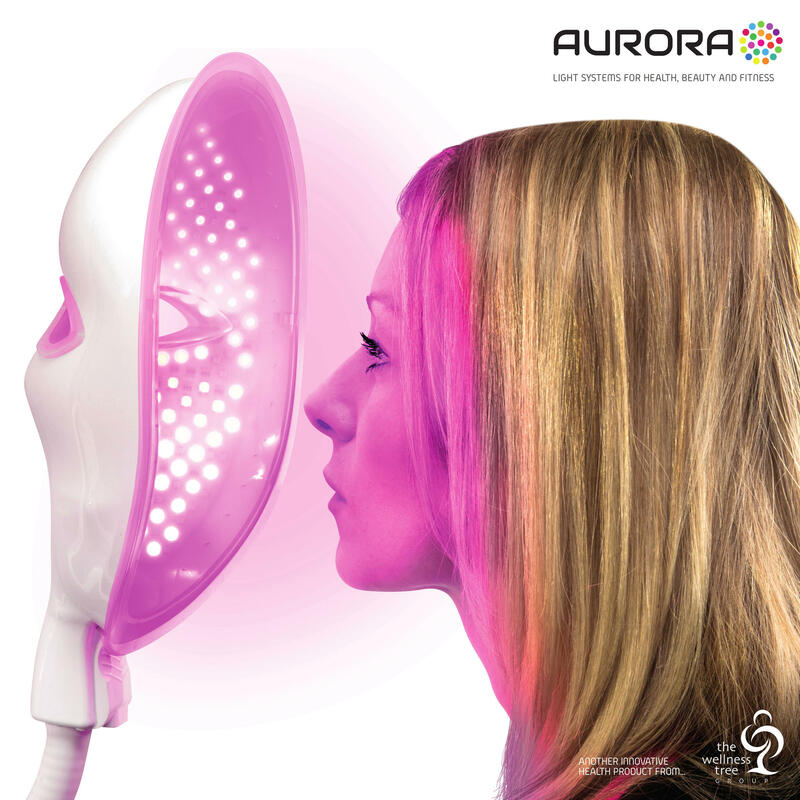 We offer light therapy with the revolutionary Aurora light therapy facial mask from the Wellness Tree Group. The Aurora light therapy facial mask uses patented technology that contours and covers the entire facial area in rejuvenating light. The mask uses a combination of 7 colours including infrared to treat a wide range of skin imperfections and signs of ageing. Unlike some treatments on the market such as lasers, peels and other abrasive treatments, LED light does not damage the skin to force it to regenerate and equally it doesn’t upset sensitive skin making it suitable for all skin types. The treatment is pain free, non-invasive and is completely safe requiring no downtime. Light therapy is medically recognised and clinically proven, with independent studies of over 40yrs of scientific research and support. 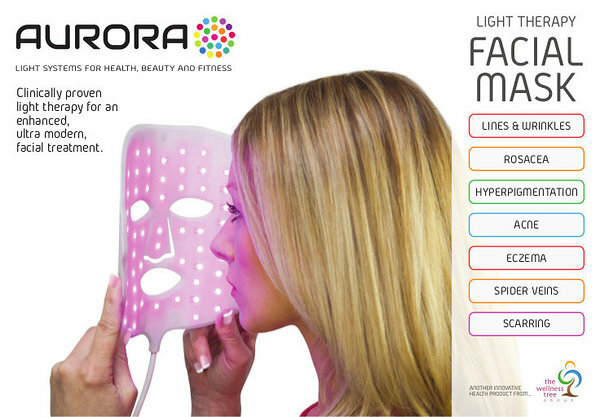 The Aurora facial masks use special light that is packed full of energy in the form of photons. When the light is shone onto the skin, these photons penetrate the skin and transfer their energy into a form the body can use called ATP. Adenosine triphosphate (or ATP for short) is the body’s fuel for energy; the more energy we have, the more the body can use this energy for proper function – such as repair and rejuvenation processes. Supercharged cells from exposure to the Aurora mask then prompts skin fibroblasts to produce increased collagen and stimulate the body’s natural healing and rejuvenation processes. Certain wavelengths of light offer different benefits to the skin. 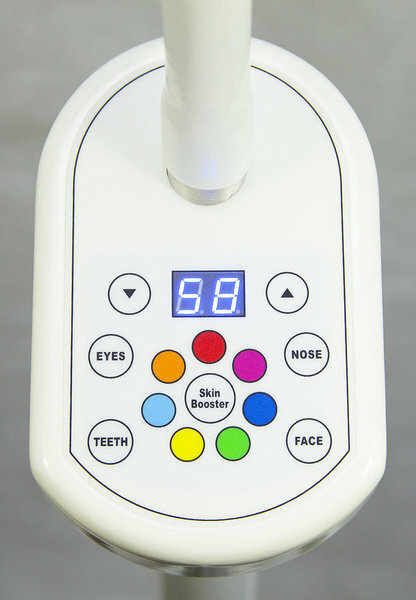 For example red light offers anti-ageing effects whilst blue light targets and kills acne bacteria. What skin conditions can be treated with light therapy? Blue light. Acne: Targets and kills acne bacteria, soothes skin, controls oil production . Green light. UV damage: Helps control Hyperpigmentation, fades sun damage. Orange light. Rosacea, Reduces redness and flushing, ideal for rosacea sufferers. Red light. Wrinkles. Improves skin firmness and radiance, reduces appearance of lines and wrinkles, reduces inflammation. 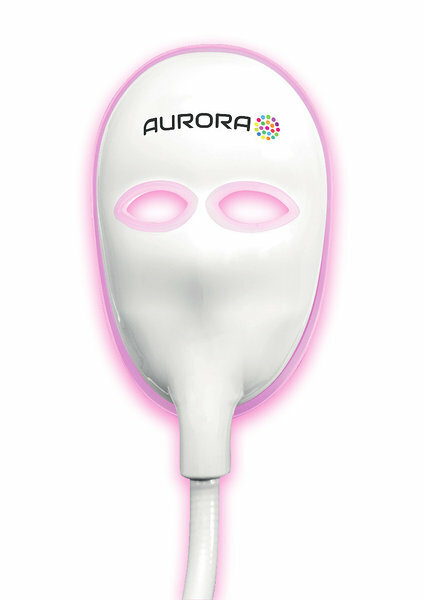 The treatment cycle for the Aurora mask is pre-programmed to approximately 20 minutes. Treatments are relaxing and you will experience a warm rejuvenating feeling with skin feeling and appearing more hydrated. Repeated use of the Aurora facial mask will increase the desired effect, with an increase of collagen production and the body’s natural rejuvenation process – resulting in more youthful looking skin and overall improvement of skin complexion. We recommend using the mask once or twice a day for at least 6-8 weeks for full effect. Kuiva silma sündroomi korral võiks teha alguses 2 korda nädalas ja hiljem kas kord nädalas või vastavalt vajadusele. For eczema, pimples and inflammations, one session will usually be enough. Depending on the scale of the inflammation, 3-5 sessions may be needed. For a runny nose and the cold 1-2 sessions will be enough. 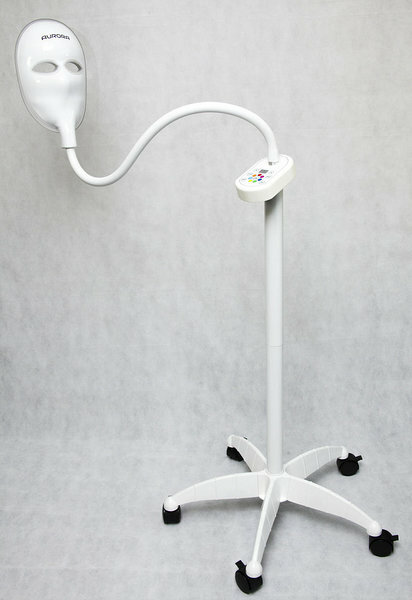 Light therapy can be used to treat the cold in its early stages. To completely heal, 2 sessions of 20 minutes should be done twice in a day. As a treatment, light therapy should be done in multiple days sequentially. You may take 2 sessions, 30 min each, per day, with 5 hours between. The most treatments are needed for UV damages, Rosacea, spots and when blood vessels become visible. For very strong acne, 10-20 sessions may also be required. If you would like to know more about LED Light Therapy for use in treating skin concerns then the following clinical studies may be of interest.